Surround yourself with tall trees, vast meadows and lush grasslands on this camping trip in Naukuchiatal. You can explore the natural delights of a beautiful campsite and lose yourself with a walk among the rich greenery all around you. You can visit the Naukuchiatal Lake to sit back and relax on the waterfront and catch a golden sunset over the shimmering waters of the lake. At an additional cost, you can also participate in adventure activities like ATV rides, kayaking, paragliding or horse riding. Or simply relax in your luxurious Swiss tents and enjoy indoor games like table tennis, carrom or billiards with your friends and family. NOTE: Prices displayed are for weekday check-ins. Weekend check-ins will be charged at INR 4,800 per person. Naukuchiatal, literally meaning “lake of nine corners”, is an enchanting lake within the Kumaon Valley. The lake is placed at an elevation of 4,000 feet, along with several others like Bhimtal, Garurtal and Ramtal, which are collectively called the lakes of Kumaon Hills. With towering mountains surrounding the Naukuchiatal Lake, it makes for a scenic place for adventure sports like paragliding and kayaking. Your campsite, located on the banks of the Naukuchiatal Lake, is only 1-hr distance away from the popular hill station of Nainital. 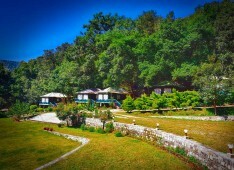 • Go camping in Naukuchiatal, a little known paradise in Uttarakhand. 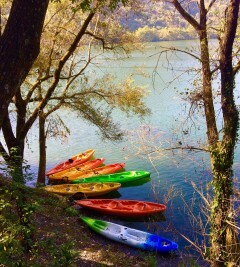 • Live in luxury Swiss tents, pitched not far away from the lake. • Explore the hills and forests around a beautiful campsite. A basic level of health and fitness is required to book this camping trip in Naukuchiatal. If you have any cardiac or respiratory conditions, or suffer from knee or spinal problems, please consult your doctor before booking this trip. Travellers are required to adhere to instructions of the tour guide while participating in any adventure activity while camping in Naukuchiatal. Consumption of drugs and other illegal substances is strictly prohibited while camping in Naukuchiatal. For cancellations made 16 days or more before check-in date of camping in Naukuchiatal: 100% refund. For cancellations made 7-15 before check-in date of camping in Naukuchiatal: 50% refund. For cancellations made 0-7 days check-in date of camping in Naukuchiatal: No refund. Please note that check-in time for the campsite is 11:00 hrs and check-out time for the campsite is 11:00 hrs. Accommodation for children younger than 6 years of age is not charged. Accommodation for children older than 6 years of age is charged at full price. The tour operator takes utmost care to ensure safety of the travellers and shall not be held responsible for any mishap or accident while camping in Naukuchiatal. 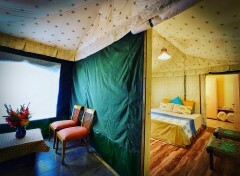 Day 1 of camping in Naukuchiatal: Check-in and enjoy! Ensure that you arrive at the campsite by 11:00 hrs. 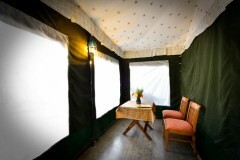 You can take some time to check-in to your luxury Swiss tents and rest at the private sit out area outside your tents. You can spend the rest of the day at leisure. Take some time to explore the natural delights of campsite and refresh yourself with a walk around the lush greenery around you. You can visit the lake front of Naukuchiatal to admire the scenic beauty of the lake. At an additional cost, you can even arrange for adventure activities like kayaking, ATV rides, horse riding, paragliding and cycling tour of the forests. | Back at the campsite, you can simply relax and have fun with indoor games like table tennis, carrom or billiards. In the evening, watch the golden sun drowning in the lake for a relaxing end to a day of leisure. Overnight at Naukuchiatal in tents. 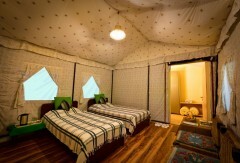 All tents comed with queen beds and attached washrooms. Wake up to a beautiful sunrise and kick-start your day with a morning walk around the campsite. You'll check out of the campsite by 10:00 hrs. Depending on availability, you can also extend your stay at the campsite. Your trip ends here. Overnight at Naukuchiatal in tents. Check-in time for the campsite is at 11:00 hrs. 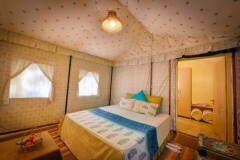 You will be accommodated in Swiss luxury tents that are equipped with queen beds and attached washrooms. No meals are included in the package, but you may spend extra to buy meals at the restaurant on campsite or visit any of the local restaurants to taste the local cuisine. Table and chairs inside tents. Depending on availability, you can even extend your stay at the campsite. Check-out time for the campsite is at 10:00 hrs. The campsite is accessible via road from Kathgodam railway station, located 1-hr drive away. You can take local transport from the railway station to reach the campsite at Naukuchiatal.